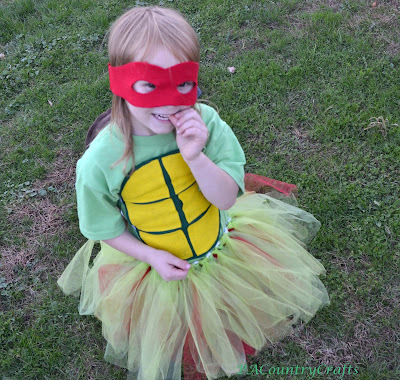 DIY Girls' Ninja Turtle Costumes- with TUTUS! We did a family theme for the first time this Halloween. 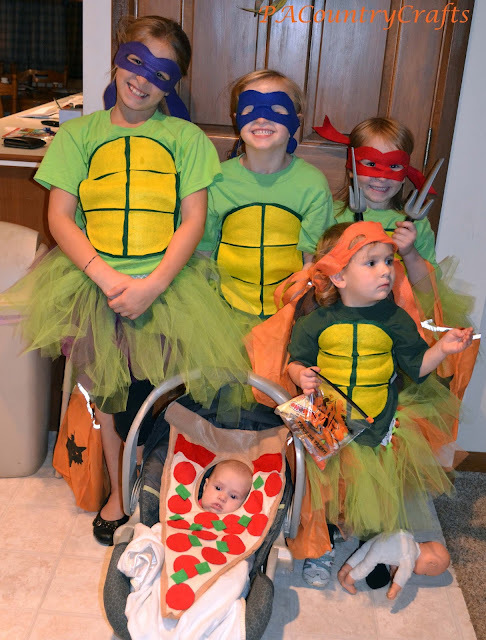 My husband came up with the idea of going as characters from the Teenage Mutant Ninja Turtles. 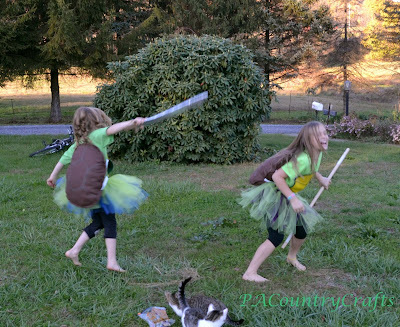 Then, the girls wanted tutus with their costumes and that was a deal breaker for the guys. We battled it out for a month or so until Team Tutu won out, meaning I had to throw together cheap, homemade costumes at the last minute. My son unwillingly went as Master Splinter (the rat) and we had to bribe him by saying he could get Hannah's share of candy, too. My husband was Casey Jones and I was April O'Neil. 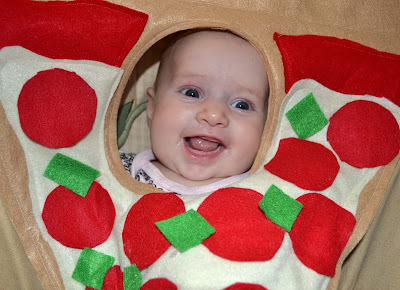 Oh, and Hannah was a piece of pizza! 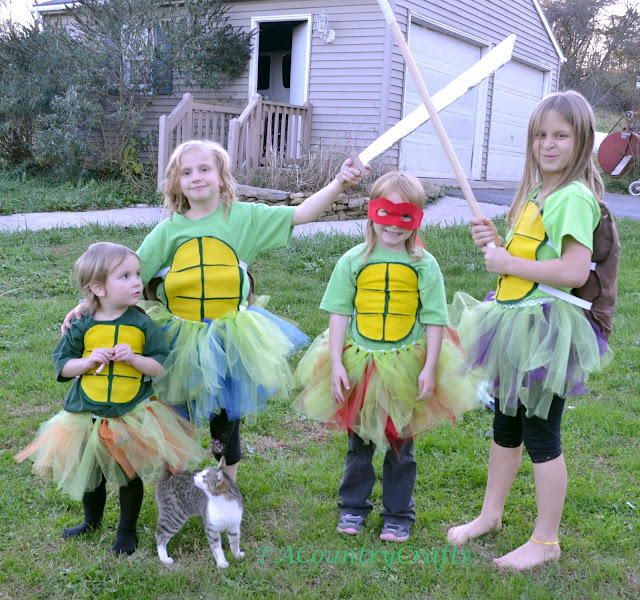 :) The boys don't like their pictures posted on here, so all I can show you are the girls' costumes. The above pic was from Halloween night. By the next day, when I had daylight to take pictures, one mask was left at school, one didn't want to wear hers, and little Michelangelo never wanted to wear hers. I didn't take pics for a tutorial since it was rushed, but I will explain how I made them... 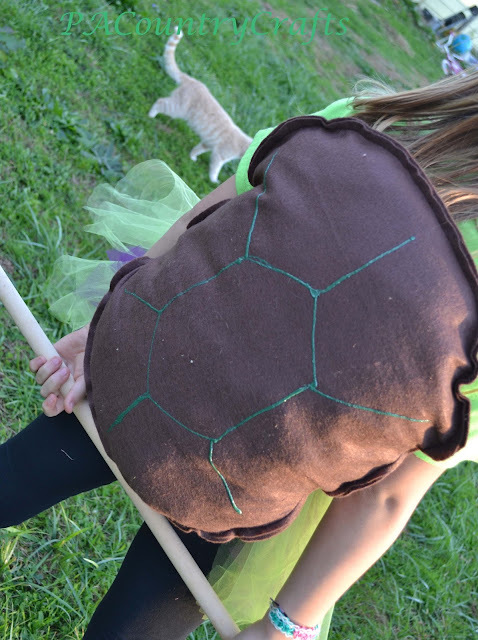 The shell fronts are made from sheets of felt and hot glue, the back shells are felt and puffy paint, and I sewed elastic in to connect them. I stuffed the back shells with newspaper because it was free and didn't leave fuzzers all over the felt like polyfil. Of course, it hadn't rained in a loooong time... until Halloween. The shells cost less than $1.50 each to make. Sweet! The tutus are strips of tulle on stretchy crochet headband stuff and there are multiple layers- some wanted just two layers and some wanted a sparkly third layer. Tulle by the yard was on sale, but not very cheap, and I got the headband stuff by the yard with a coupon at Joann's. So, the total for each tutu was under $6. Oh, and Daddy insisted that they all needed the corresponding weapons. He made a cardboard sword with duct tape and I put athletic tape on a dowel rod I already had for the bo (stick thingy). The other ones came from the Dollar Tree. 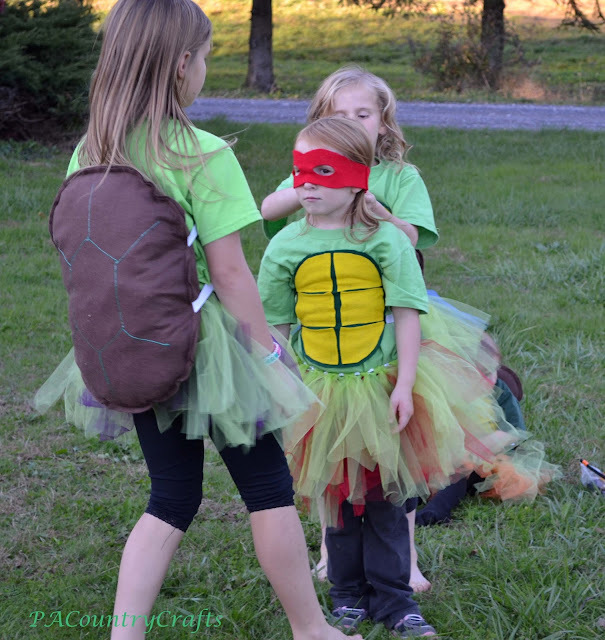 If you are doing the math it came out to $7.75 - $8.75 per turtle- not too bad considering the most expensive part was the tutus that will likely be worn for play all year. (Boys' costumes without tutus would be cheaper, though.) 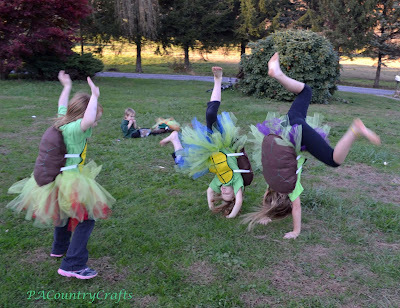 The girls had a lot of fun doing a little photo shoot the next day and practicing their turtle moves.